Sweet tap-dancing Christ, but THE ASSASSIN is a slow watch. I knew this wasn't going to be any old wu-sha movie, being directed by art-house darling Hou Hsaio-Hsien, but this movie takes the action out of action movie. 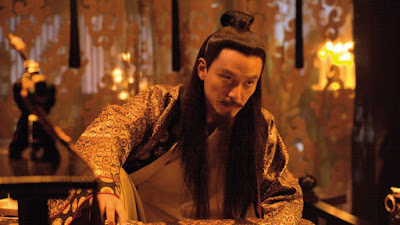 The film is set in ninth century China and there's apparently some beef between the Imperial Court and the province of Weibo. Moreover, back in the day the Imperial princess married into Weibo broke a betrothal with our protagonist, Yinniang, because she wanted to shore up the inheritance claim of her adopted son Lord Tian. Yinniang then becomes awkward politically and is farmed out to the Princess' sister-nun-martial-arts-guru who trains Yinniang into an amazing assassin. The nun sends her back to her family to kill her ex-fiancee and thus prove how badass she is. All of which might lead you to expect to see lots of awesome action. Foolish, foolish people. The first hour of this tiring film basically consists of beautiful people wearing beautiful costumes and sitting around in oppressively ornate courtrooms or in lavishly stunning woodland playing ancient Chinese instruments or giving us their back story. And even when Yinniang finally starts moodily stalking her ex- all we get is her hiding behind lace curtains, and any time she might have a go, the director cuts away to a woodland scene. It's as though he's deliberately taunting us! It's also quite amazing how such a wordy film can be so obscure. It took me about 20 minutes to figure out who the woman faking her period with chicken blood was and why she was relevant. And various people get sent away and killed in this internecine warfare for reasons I still haven't quite figured out. I've been reading a lot of reviews of this critically acclaimed film trying to figure out where I've gone wrong in failing to appreciate it. After all, Hou Hsaio-Hsien won Best Director at Cannes! But all I can see is critics falling over themselves to justify his tactics in spite of themselves. The stillness is a virtue. The obscurity is a virtue. They all talk about the ravishing production design but I'm sorry that's not enough. I don't need an action movie to be all action all of the time but I do need the Kubrickian tableaux to be enlivened by the occasional action set-piece. And yet I get the impression that this direction actually hates action because he is trying to foreshorten, subvert and undermine it at every turn! And as for the much lauded transition from Academy aspect black and white during the prologue to 1:85 colour for the main body of the film, that just seems unnecessary and pretentious. I'm sorry but I'm just not buying this as a masterpiece of direction. It's pretty but it has no narrative drive or clarity and it's boring. THE ASSASSIN has a running time of 107 minutes. It played Cannes 2015 where Hsaio-Hsien Hou won Best Director and Gong Lim won Best Soundtrack. The film opened earlier this year in China, Hong Kong, Taiwan, Singapore, Japan and Finland. It opens in France on March 9th.